This recipe is something to say farewell to Summer with as this Friday is the first day of Autumn and I couldn’t be happier. I do love a bit of nice weather but growing up in one of the most commonly wet countries on earth I don’t expect too much for my Summers. I can generally count on Autumn being cold and a bit darker and altogether cosier. Something I do love about Summer is the abundence of fresh in Season fruit. Peaches are one of my favourite fruits to add into savory dishes, it must of started from childhood when my mother used to add tinned peaches on top of a curry. We previously feautured this recipe in Image Interiors Magazine. Begin by grilling your peaches, you can do this either on a BBQ or on a griddle pan. Slice the peaches and remove stones. Place onto a dry pan and grill for about 1 or 2mins or until soft and juicy, you will begin to hear the juices releasing and starting to sizzle. 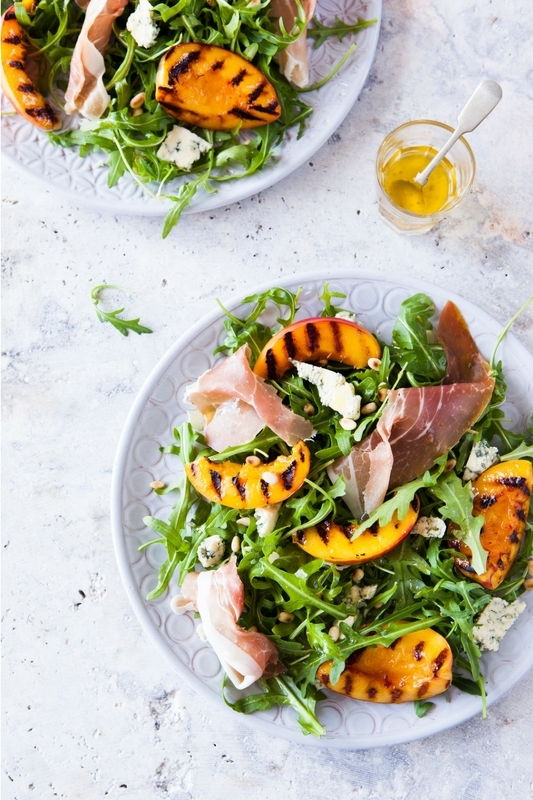 Meanwhile in a bowl, mix together your Rocket leaves with dressing, place on a plate with blue cheese, parma ham and your grilled peaches. Drizzle with a bit more dressing and some pine nuts.